Here are pictures of Dawson on each of his Halloweens. 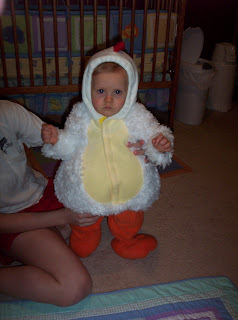 Dawson (9 months old) was a chicken his first Halloween. He was adorable!! This is probably my favorite costume of all. We didn't participate in any Halloween festivals because it happened to be a rainy night, but we still put his costume on so we would have some very cute and memorable pictures. For Dawson's second Halloween, we dressed him as a race car driver. 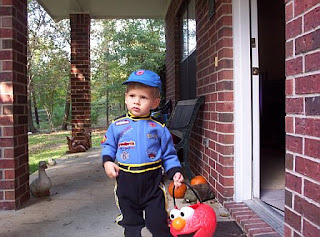 He was really interested in cars at the time so it was a fitting costume. That year we went to our town's Scare on the Square and the university's Halloween festival. This year Dawson was very excited about Halloween. 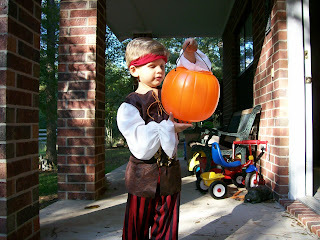 He loved all of the Halloween decorations and thrilled with the idea of dressing up in a pirate costume.